“Baseball.” You know how when someone says your name, it tickles that little part of your brain with a “hey, that’s me!” sensation? For me, there are a few other words that have that same effect on me. One of those is “baseball.” A love of baseball is literally a part of my internal identity. But the choice was plebeian or liar, and I’ve heard that very few successful relationships are based on lies and people pretending to be things they’re not. As we talked, I felt better and better about my passion. It’s been 15 years, and my feelings have just gotten stronger. There is nothing inherently better or more refined about a passion for music than a passion for baseball. The way I describe it now is that baseball is “the most important unimportant thing in my life.” In the grand scheme of things, baseball is unimportant, but so are piano music and literature and Italian food and Crossfit. Those things are means to an end, the end being a happy life. So long story short, baseball is the most important unimportant thing in my life. When my wife and I got married, we agreed that for any boys we had, she would choose the first name and I would choose the middle name. I warned her that I would probably choose baseball names, and she was okay with that. It was about 3 1/2 years between when we got married and when our first son was born, and over those years I realized that choosing a baseball player to name a child after is not an easy thing. Growing up, I loved baseball and idolized many players, but I idolized them as baseball players, not necessarily as people. I had real people in my life to look up to — parents, friends, church leaders, etc. — so I never felt the need to look to famous strangers for tips on how to live my life. But as I considered naming my future son after a baseball player, I was keenly aware of the potential for backfire. I was born in the mid-1970s — imagine if my parents had named me after the big football star of the time, a fellow by the name of O.J. Simpson. I feel like they might have eventually regretted that decision. After considering several options — only dead players (less likelihood of embarrassing revelations), just generic baseball words instead of players (we considered “Dodger” for a middle name) — I finally decided I’d stick with Hall of Famers who had pretty universal admiration and who carried personal meaning for me. So now, to make a long story slightly less long, I have sons named after Cal Ripken Jr. (my favorite player of all time), Nolan Ryan (the player I most wanted to be like growing up), and Sandy Koufax (the greatest pitcher for my favorite team). I feel like these are solid choices, and I’m as confident as I can be that we won’t suffer any O.J.-level embarrassment. But there are no guarantees. I don’t know how sparkling O.J.’s reputation was before 1994, but I’m sure no one expected anything like what happened. Pete Rose, Kirby Puckett, Lenny Dykstra, Lance Armstrong, Tiger Woods — just a few athletes who had downfalls that were somewhere between surprising and shocking. I am occasionally nagged by a worry that one of the players I’ve named kids after will become embroiled in some sort of controversy. I guess the easy answer is, “Don’t name your kids after professional athletes,” and I won’t criticize anyone who chooses to go that route. But I think it points to a bigger issue, one that has caused plenty of hand-wringing and occasional couch-fainting lately: “Think of the children.” Yes, I think it’s overblown, but I don’t think it’s a non-issue. I have used Alex Rodriguez as a cautionary tale for my oldest son, Logan (middle name: Ripken), telling him about the guy who was the best player in baseball but still felt the need to cheat so he could be even better. When I tell those stories, I conveniently omit the part where A-Rod was my favorite active player for about a decade, and I’m glad my boy isn’t old enough to remember that. I remember when Roger Clemens was named in the Mitchell Report. It was like a punch to my gut. It wasn’t that I had placed him on a pedestal as some great man and my images had been shattered — long before that, it was pretty clear that he was at least a minor jackwagon, if not a major one. The original punch in the gut was purely a baseball response: one of the best pitchers in baseball history got that way by cheating. There is a lot of nuance you can add — the culture, how MLB tolerated and kind of encouraged the cheating, many of the hitters Clemens dominated were on the juice too, etc. — but the gut reaction is kind of the point. Baseball is important to me, a part of my internal identity, so to have one of its greatest players tainted felt personal to me. Similarly, there is a part of me that feels that any player’s downfall diminishes me, because I am involved in baseball. Roger Clemens was my first experience with that. Later there was A-Rod, which felt even more personal in some ways because he was my favorite player. Now, though, Logan is seven, and he is really getting into baseball. He comes home from school and puts on his baseball pants and his Clayton Kershaw jersey and he heads out to the backyard to play. We watch games together. 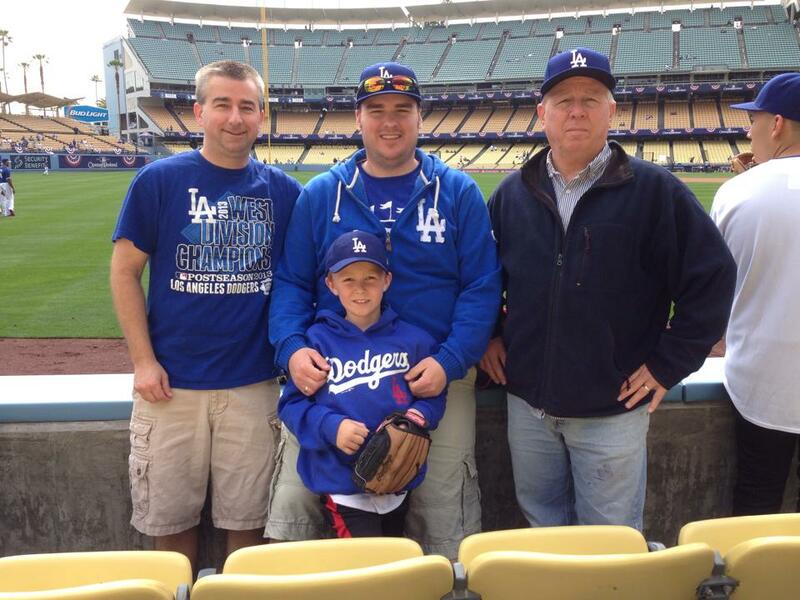 We’ve repeatedly made the 700-mile drive to Dodger Stadium to watch our boys play. We’ve driven to Arizona to spend a week watching Spring Training. He has been to games in eleven Major League stadiums, two Minor League stadiums, and three Spring Training stadiums. One wall in his bedroom is painted to look like a giant baseball, and another is Dodger Blue with the LA logo painted in white. And this kid loves Clayton Kershaw. 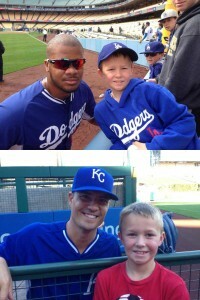 Logan with Kenley Jansen in April and Jeremy Guthrie in October. I didn’t really push my son to be a Kershaw fan, although I’m sure he picked up on the fact that I am. When my wife and I went to game two of the 2009 NLDS between the Dodgers and Cardinals, I told her how excited I was to see a future Hall of Famer pitch in the playoffs. That was 2009, when he was 21 years old and had a 13-13 career record in 51 starts. I’ve been on the Kershaw train from Day 1, and my son obviously sees that. But Logan picks his own players for his own reasons. He really likes Hunter Pence (“Intense Hunter Pence,” as he calls him). 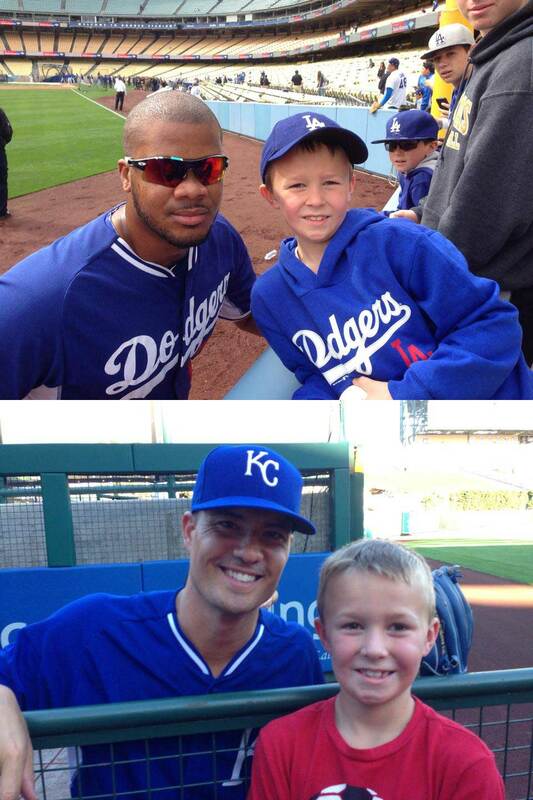 He likes Kenley Jansen because he met him this past April, and Jeremy Guthrie has become a favorite in the month since he got a picture with him. Kershaw, though, is different. Sometimes I look out in the backyard and see Logan pitching from the stretch, doing the same exaggerated motion as Kershaw, reaching for the sky and then bringing his hands down to his belt with his front shoulder about six inches above his back one. He has a framed newspaper article on his bedroom wall from Opening Day 2013, when Kershaw broke a scoreless tie with a solo homer in the bottom of the eighth inning. When Kershaw threw his first career no-hitter on June 18, Logan wrote in his journal about how much he enjoyed watching that game with his mom and dad and grandma and grandpa. Clayton and Ellen Kershaw in junior high, before I started expecting them to live their lives for my child. From a personal standpoint, I can’t imagine a better player for my son to idolize. 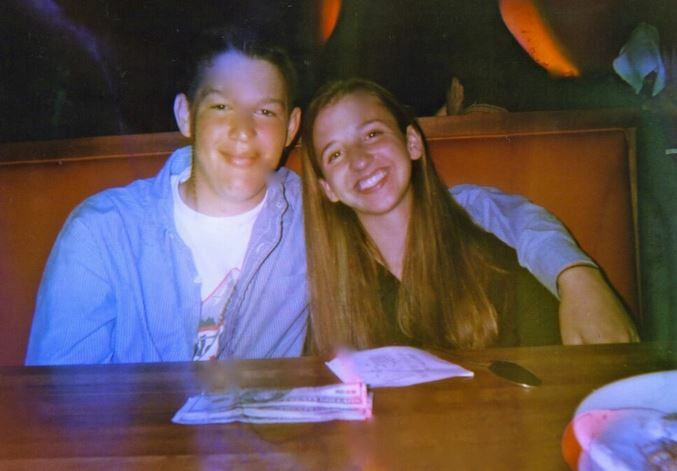 Clayton and Ellen Kershaw seem to be genuinely great people, committed to their beliefs and to the notion of using their fame and fortune to make the world a better place. Logan sees that, and he appreciates it. I think he considers the Kershaws personal friends, even though he has never met them. (Funny story: a couple months ago, I read that Ellen was pregnant with their first child. I said to Logan, “Guess who’s pregnant?” His first guess: Aunt Kelly, who had just had a baby the previous week. His second guess: Ellen Kershaw.) As far as I can tell, if I believed in children having professional athletes as role models, Clayton Kershaw would probably be my first choice. But. But, but, but. What if? What if, what if, what if? Professional athletes make mistakes. They are often not what they seem to be. We sometime ascribe great personal qualities to them based on totally irrelevant athletic prowess. I believe that Clayton Kershaw is both a great pitcher and a great person. I believe that he and Ellen are genuine and wonderful and generous and committed. But, but, but. What if, what if, what if? Logan with (L-R) Uncle Chris, me, and Grandpa Snider. It’s not fair. Charles Barkley said it 20 years ago, and I think it’s true: athletes should not be kids’ role models. It’s not fair to Clayton Kershaw or anyone else to heap the responsibility of raising our children onto his shoulders. My wife and I should be our kids’ role models. They have aunts and uncles and grandparents and family friends who should be their role models. I don’t want Clayton Kershaw to be a good person because millions of kids are looking up to him. I want him to be a good person because he wants to be, because it is ingrained in his and Ellen’s DNA. But I can’t deny that I do want him to be a good person. It’s not his responsibility to be my son’s role model, but people are not just one thing. I’m not going to try to teach a young child the concept of “admire his baseball ability, but don’t put too much stock in him as a person just in case he disappoints us later.” I don’t think expecting Kershaw to disappoint us is any less unfair than heaping expectations on his shoulders. What Logan knows is that he thinks Clayton Kershaw is amazing, and only part of that has to do with baseball. So I spend a lot of time hoping and praying that this 26-year-old kid can live up to the impossible standard that has been set for him. I root for him as a player, and I root for him as a person. I believe that he won’t let me down in either respect. But I don’t think I could name a kid after him yet.